One of our high-quality and stunning FSC® certified timber Garden Sheds was recently installed for a customer based in Winnersh, Berkshire. Measuring 1.8 x 3.6m, the building boasts a custom door which was designed and hand-built at our Norfolk factory before being delivered and installed by our expert installations team. Designed and hand-built at our Norfolk factory, this charming Weybourne corner Summerhouse was recently installed for a customer based in Warfield, Berkshire. Made using only the finest FSC® certified Scandinavian Redwood timber, the Summerhouse boasts an attractive hipped roof topped with a traditional finial and small overhang over the double entrance doors. The building was also both delivered and assembled at the customer’s address by our in-house installation team. This incredibly attractive Superior Shed was recently installed for a customer based in the Chapel Row area of Reading, Berkshire. Designed and hand-built at our factory in Norfolk, the shed was both delivered and installed by our expert, in-house fitting team at the customer’s specified delivery address. This convenient hybrid of two buildings was recently installed for a customer based in Slough, Berkshire. 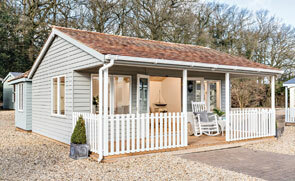 The design features a Blakeney Summerhouse with a Superior Shed at the opposite end for storage. The versatile design was hand-built in our Norfolk factory before being delivered and installed at the customer’s specified delivery address. One of our distinctive Blakeney Summerhouses was recently given a new look with leaded windows and half-glazed doors. Designed and hand-built at our Norfolk factory, the building was delivered and installed by our expert, in-house fitting team who ensured everything was perfect before leaving the customer’s property in Maidenhead, Berkshire. One of our spectacular Garden Rooms was recently installed for a customer based in Cookham, Berkshire. Selected from our range of stunning, FSC® certified timber Garden Rooms, it was designed and built by hand at our factory in Norfolk before being delivered and installed by our expert, in-house fitting team. 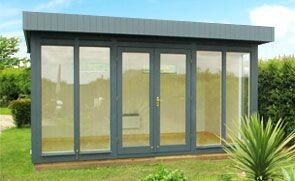 One of our showstopping Pavilion Garden Rooms was recently installed for a customer based in Hungerford, Berkshire. Designed and hand-built at our Norfolk factory, the building was both delivered and installed at the customer’s address by our in-house fitting team. One of our attractive and functional garden sheds was recently installed for a customer based in Bracknell, Berkshire. Measuring 2.2 x 2.9m, the shed was both delivered and installed by our expert fitting team as part of the exceptional service offered by Crane. One of our contemporary, stylish and attractive Salthouse Studios was recently installed for a customer based in Cookham, Berkshire. The studio was selected by the customer from our range of high-quality, FSC® certified timber buildings before being designed and built at our Norfolk HQ, and then delivered and installed by our expert in-house fitting team. 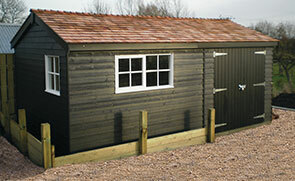 This attractive Superior Shed was recently installed for a customer based in Cookham, Berkshire. Measuring a bespoke size of 3.6 x 7.2m, the building is a generous size tailored to the individual needs of the customer. The building was both designed and built at our Norfolk factory, before being delivered and installed by our expert in-house fitting team as part of the exceptional Crane service. This handsome 2.4 x 3.0m Greenhouse was designed and hand-built at our Norfolk factory using only the finest FSC® certified timber then was subsequently delivered and installed by our expert fitting team as part of our exceptional service. This 2.4m x 3.0m Superior Shed installed in our customers beautiful country garden in Reading, Berkshire benefits from our exclusive exterior paint in Verdigris, together with heavy duty roofing felt for maximum protection from the elements. 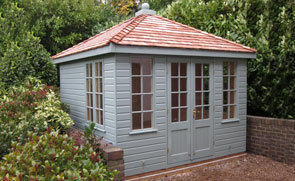 This charming Wiveton Summerhouse was recently installed for a customer based in East Garston, Berkshire. Measuring 3.0 x 3.0m and boasting smooth shiplap cladding, the entire building was hand-built using only FSC® certified timber in our Norfolk factory. This large Superior Shed was recently installed for a customer based in Datchet, Berkshire. The ideal workshop, this 3.6 x 6.0m Shed enjoys full insulation and interior oak-faced lining with a heavy-duty floor, meaning it is not just suitable for year-round use, it is also well protected against frequent footfall and the storage of heavy machinery. This functional Superior Shed and Workshop was recently installed for a customer based in Hoe Benham, Berkshire. Measuring 3.0 x 4.2m and with an apex roof, the workshop is the perfect space for the storage and usage of appliances and machinery. This Timber Garage is 3.0 x 7.8m in size, and it has been installed in our customer’s garden in Newbury, Berkshire to use as a garage for their motorbikes, as well as a place for storage. This 1.8 x 2.4m National Trust Felbrigg Garden Shed has been installed in our customer’s beautiful, country garden in Ashampstead, Berkshire to be a gardening hub for the customer to store tools inside and keep seed trays protected. Installed in our customer’s country garden in Streatley, Berkshire, this 3.0 x 4.8m Superior Shed is to be used as a helpful storage room for use as an overspill from their garage for things like garden furniture, their lawnmower and gardening tools. This octagonal Wiveton Summerhouse is 3.6 x 3.6m in size, and it has been installed in a hedge-surrounded section of our customer’s garden in Kintbury, Berkshire to use as a year-round use entertainment/relaxation retreat.